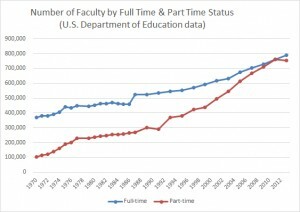 Martin Kich has a post up over at AAUP, questioning whether I have correctly diagnosed the source of “adjunctification” in U.S. higher education. As I noted in my last few posts, the growth in adjunct employment over the past several decades appears to be driven heavily by two factors: (1) the rise of For-Profit Higher Ed and (2) the growth of community colleges. Both of these institution types use disproportionately high percentages of adjunct faculty when compared to the rest of academia. With for-profits, it’s upwards of 90% adjunct. Community colleges are about 65% adjunct – and this makes intuitive sense, as they offer a less expensive product that caters heavily to technical and trade skills that are not found in the more advanced sectors of higher ed. Kich argues that I may have overstated the For-Profit impact, since the adjunct rate for all “public colleges and universities” (46.1% in 2006) is only slightly less than the national rate for all of U.S. higher education, including the for-profits. What Kich is neglecting though is that “public colleges and universities” includes community colleges, and community colleges introduce a large adjunct skew to the totals. This may be seen in the highlighted sections below. The figures I’ve circled in red are for the various types of traditional public and private institutions that offer degrees at the B.A. level or higher. 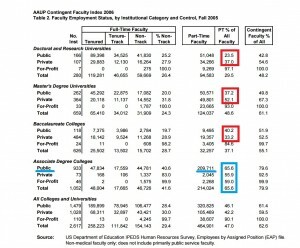 Note that with the one exception of private Master’s universities (a figure that I suspect includes a number of MBA-style professional degrees, which can be adjunct-heavy), all of these institutions employ adjuncts at rates that are significantly below the percentages for all U.S. colleges and universities. 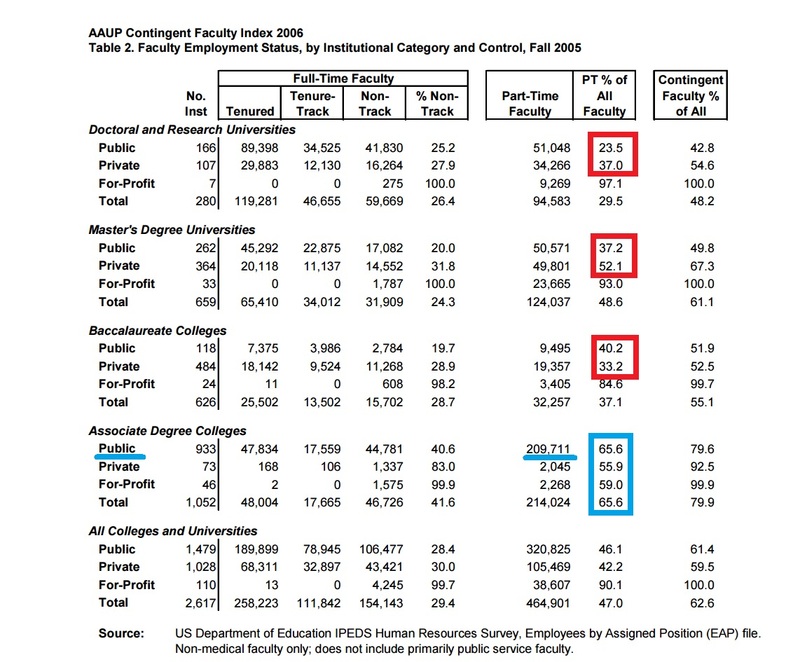 Next look at the numbers that are highlighted in blue – these are the community colleges, and all but a tiny sliver of them are public institutions – in fact the largest single category of faculty employment at public institutions. They are also disproportionately dependent on adjuncts at a rate of about 65%. Quite clearly, the total figure that Kich cites for public institutions is being skewed upward by community colleges. But let’s say that Magness is right and the statistics have been skewed by hiring at the for-profit institutions. Then we should be seeing very changed numbers as soon as the data for the last three years becomes available since there has been very dramatic declines in the enrollments at all of the largest online for-profit institutions—and the complete elimination of one of the largest of those institutions, Corinthian Colleges. 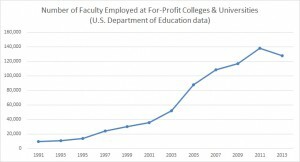 Note that for-profits alone do not explain the entire “adjunctification” phenomenon. 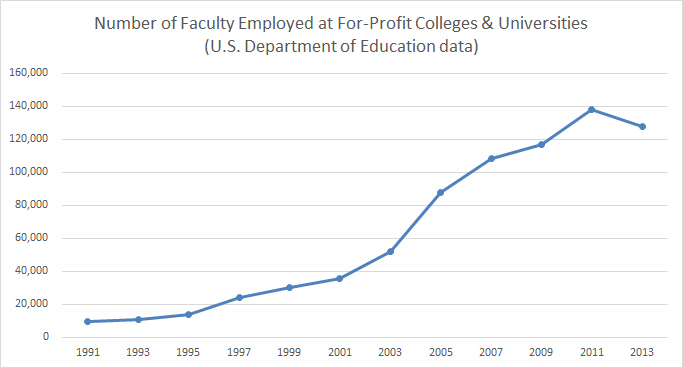 I estimate that they account for about 25% of adjunct growth since 1991, which is a pretty astounding figure considering that for-profit higher ed makes up only about a tenth of the U.S. university system. The next biggest driver is normal growth at community colleges, followed by a much more subdued use of adjuncts at traditional 4-year colleges and universities. But if the most recent data sets are any indicator, it would appear that my theory about the central role of for-profits in the adjunct phenomenon (not to mention Kich’s prediction of what we should be expecting in the wake of the for-profit bubble bursting) finds direct confirmation. 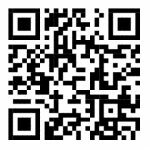 This entry was posted by Phillip W. Magness on Tuesday, August 25th, 2015 at 9:48 am	and is filed under Uncategorized. You can follow any responses to this entry through the RSS 2.0 feed. Both comments and pings are currently closed.